If I were to post the question of what Walt Disney World restaurants are most often or most likely to be reviewed, I am sure that many of us would come up with the same names: California Grill, Victoria and Albert’s, and perhaps ‘Ohana. With so many amazing restaurants to choose from the list could go on and on. Yet the simple fact of the matter is, while many of us will enjoy a fine dining experience or two during our Disney World stay, more often than not, we will find ourselves dining at a quick service restaurant in order to either save some time or money. Just because a restaurant doesn’t require an ADR, doesn’t mean it cannot be a wonderful dining experience. Every trip, there are a few of these, less well know restaurants, which are “flying under the radar” as it were, that I simply cannot wait to eat at. One of these, which is an all time favorite of mine, is Gasparilla Grill and Games at The Grand Floridian Resort and Spa. As resort quick service locations go, this one is tops. While there will be a few offerings which surprise no one, you will of course find the ubiquitous cheeseburgers with fries, chicken breast nuggets and pizzas, but at the same time you will be treated a few items which are more unique, not to mention one which will flat out knock your socks off (well, if you are anything like me anyway!). Some of the more original offerings include a delicious Italian meat sandwich, which, although I have never had it, friends have enjoyed immensely. There is also a Jerk Chicken Sandwich, a fan favorite of those who like a little spice in their diet, it is not too hot, but certainly enough to warm the palate for most diners. I must say though, the one item on Gasparilla’s menu that brings me returning, time and time again, is their Reuben Hot Dog. A delightful creation that brings together one of the all time best sandwiches ever created, and combines it with an American classic. A grilled hot dog, smothered in sauerkraut, topped with corned beef and melted Swiss cheese…with just a touch of Russian dressing. It is a cardiologist’s worst nightmare and a dream come true for at least one Disney Geek that I know of. The lure of Gasparilla is not only limited to its menu selection. The entire atmosphere of the restaurant is casual, while still staying true to the overall theme of the resort. It has a very “homey” quality to it, yet feels a bit more refined than most “grab and go” establishments. Another fantastic thing about this restaurant is its location. Whether you are a guest of the Grand Floridian or not, just outside the doors of the Gasparilla Grill is one of the finest places to view the Magic Kingdom’s night fireworks spectacular, Wishes. As most of you who have read my “scribblings” before can attest to, I am a huge proponent of slowing down and enjoying all aspects of The World. Gasparilla Grill and Games is one of my most highly recommended spots to do just that. Stop by, grab a dog and stake out your spot before Wishes…it doesn’t get much better than that!!! To hear more about my thoughts on the Grand Floridian Resort & Spa, head on over to All About the Mouse. This past week, I had to opportunity to sit down with Bryan Ripper and chat about all things Floridian on the show. The Grand Floridian - Doc's dream resort! 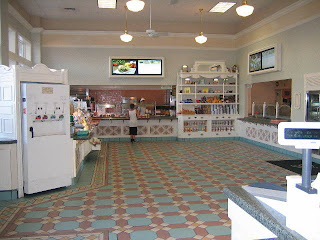 My wife and I ate here once when we couldn't get into the Grand Floridian Cafe. I must say, I enjoyed it. Well I am gonna have to get the Reuben Hot Dog for sure - that sounds like heaven on a bun. Good write-up, must check the place out next trip.